5 questions that will save any meeting even if you are not the person leading it. Remember the last really lousy meeting you had to sit through? A total waste of your time when you have much better things to do. 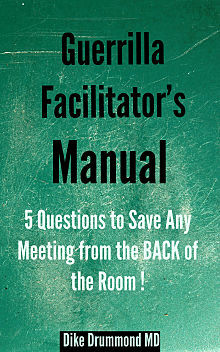 The Guerrilla Facilitator's Manual contains five simple questions you can ask from the back of the room to save any meeting, keep everyone on track and actually get something done this time. Take the questions to your next meeting and see the difference it makes! If you have any questions please use this Contact Form to connect by sending us a quick message.